Instant Video Replay Capabilities Ready to Go. Video deposition and transcripts synchronized and indexed for quick reference. You want to find important testimony and facts quickly and easily. And you want to be able to produce them when the court asks. 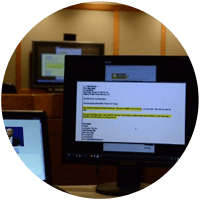 We electronically transcribe and synchronize the official transcript with the video deposition, which allows us to search across all of the discovery testimony. This provides your trial team with the ability to access any piece of testimony in a matter of seconds. Have video testimony easy to access and share.